Brunswick Mess Hall Wedding of Nicole and Simon. On a very, very warm Melbourne summer’s day Nicole and Simon tied the knot in front of family and friends at the very cool Upside rooftop bar in Fitzroy. Nicole looked absolutely stunning in her Theia couture gown with Simon also looking looking sharp suited up with bowtie! With the wooden ring box expanding because of the heat- groomsmen and guests tried frantically to pry it open with much applause as they succeeded! After a beautiful ceremony, Nicole and Simon mingled with guests for a few drinks at the bar before we headed off for photos. Being Fitzroy there is always cool laneways and so we escaped the heat for a few portraits before heading to a local park for a few more pics afterwards. 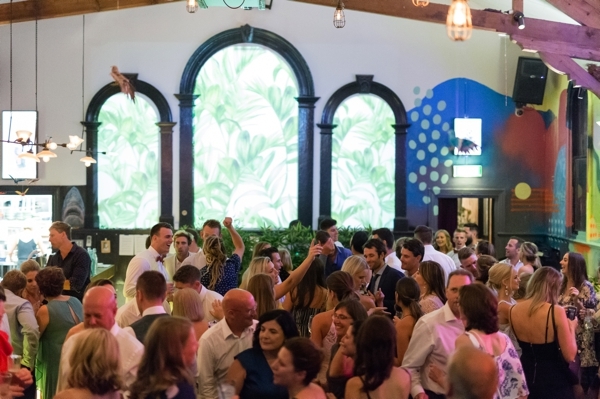 Nicole, Simon and their bridal party then headed over to the Brunswick Mess Hall for their reception- the venue looked absolutely amazing with guests mingling and roving canapés everyone celebrated into the night. Thank you for having us along to capture your beautiful day Nicole and Simon. Shannon and Christine.